This is a sponsored post written by me on behalf of Chase Mortgage Banking for IZEA. All opinions are 100% mine. According to a survey conducted by Chase Mortgage Banking in March 2015, last year’s somewhat mixed results when it came to the real estate market have made way for a new sense of optimism this year when it comes to buying a new home. The survey entailed the polling of responses from 1098 Americans from all across the country and the results were really interesting. The implication is that the recovery of the real estate sector, though delayed in 2014, will gain momentum again in the next two years – 3 out of 10 Americans surveyed responded that they intended to buy a new home in the next year and a half. Respondents not only seem more optimistic about the state of the economy but also more optimistic about the navigation of red tape. Of the respondents surveyed, 43% felt that it would be simpler to qualify for a loan this year, as opposed to last year. About a fifth of those surveyed stated that the rising cost of rent is their number one reason to buy, making owning a better value. Around about a fifth of current homeowners surveyed stated their wish to upgrade their home as their primary reason for buying property. This, in conjunction, with the currently low mortgage interest rates does make the buyer’s market very attractive at the moment, with around about a third of respondents believing it would be a good idea to buy fairly soon, before the rates increase again. It seems that it is a delicate balancing act on the part of banks – 35% of those surveyed admitted that interest rates higher than 4% would make them put off buying a new home. It is not all optimism though – around 70% of respondents feared that they may have missed the boat to buy at the best time because of rising home prices. The truth lies somewhere in the middle – home prices have risen but that does not mean that there are no more good deals to be gotten. With the current low interest rates, and the definite optimism about the economy, it is certainly still a good time to buy your own home. What does make this survey so interesting is that Chase Mortgage Banking clearly understands their market and what is important to prospective and current homeowners. 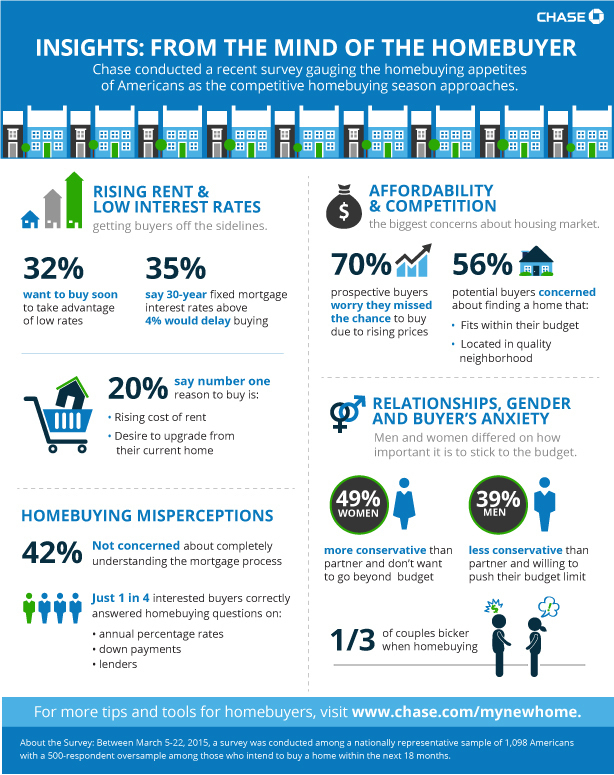 The survey even delved down into common misconceptions when it came to buying a house and a great need for more information regarding the mortgage process was identified. Almost half the respondents admitted to not being worried about understanding how the whole process worked and only 1 in 4 respondents were able to correctly answer questions relating to rates charged, lenders and down payments. For most people, buying a house can feel quite overwhelming. But Chase Mortgage Bank helps to make it easier, with their tools and resources available to anyone who would like to use them – client or not. Visit Chase Mortgage Banking for information. If you want to find out what mortgage installment you will be paying a month, their mortgage calculator can help with that in a few seconds. If you just want to buff up you knowledge regarding the procedures, you’ll find all you need on their site. Need some expert, one on one advice about whether or not you are ready to take the plunge? Head over to My New Home YouTube channel and watch the videos, featuring people like you and me, to help you make up your mind.